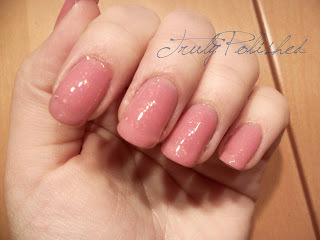 Truly Polished: My pink franken! Today I have a franken I made last night. I really wanted to paint my nails but nothing in my stash caught my eye, so I took matters into my own hands. I wanted something girly but classy and I wanted flakies! I really wish I'd have written down how many drops I used of each, but this was purely an experiment. 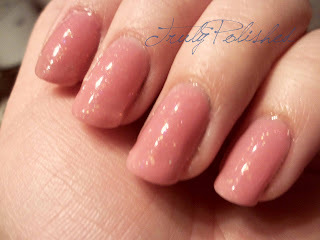 It was a few drops of each and then some clear to make the glitter and flakies more visible. The formula on this was a nightmare! It was an off the cuff frankening session, so I didn't have a proper dish or anything. Instead, I used a piece of cellophane! I was also doing it in front of a fan heater because my boyfriend has set the heating to switch off at night and I don't know how to reset the boiler! This all meant that the polish was drying as I was trying to get in on the brush! I actually really loved the polish. I could happily have a whole bottle of it! This is definitely one to consider next time I want to make a whole bottle of something.